Install a stunning set of bi-folding doors today with the help of our finance options. At SWD Essex, we offer flexible payment schemes, so you can achieve your dream home improvement. Your home is made for living – why wait? Popular for contemporary homes, our aluminium bi-fold doors can be supplied in virtually any colour. Lightweight, strong and maintenance-free, they are perfect for modern living. We bet you have already got an idea of where exactly you want your new bi-folds to go. Our buy now and pay later option is ideal for those larger purchases. Pay in manageable monthly instalments rather than paying upfront. Choose this option for 12 months interest free double glazing. Perfect for those who cannot pay upfront right way, you can begin paying in monthly instalments suited to your budget. Completely interest free for the first 12 months– no hidden costs. Opt for low interest, affordable monthly payments and be in control of the term and interest paid. Credit is subject to status. Current rates as at February 2018. Everyone wants a higher standard of living through increased light or floor space however achieving the perfect home is not easy. Not everyone has the means or fund to create their ideal home. 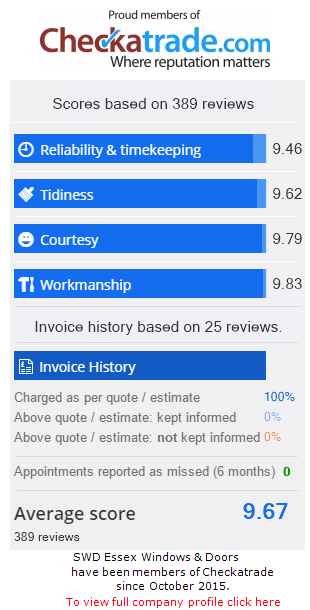 This is why we offer home improvements on finance. We understand that not every homeowner can afford to pay an up-front sum. We help homeowners in Essex achieve the home they have always aspired to have. When it comes to looking at the cost of your new aluminium bi-fold doors, our finance options can make things a lot more straight forward. With no need for a lump sum upfront, you can spread the cost of your new doors. You can get them installed immediately and start enjoying your new open space, without the worry of cost. Our finance options will allow you to fund your new aluminium bi-fold door in a flexible and affordable way. Increase your property value, improve your living and contact us today. Why Choose Our Aluminium Bi-Folding Doors? Sleek, modern and stylish, our aluminium bi-fold doors are highly attractive. They boast effortless functionality whilst bringing superior security and energy efficiency to your Essex home. Bi-folding doors are popular choice for many. Made up of a set of glazed panels, these doors can effectively open up an entire wall of a house, giving unrestricted access. They can open left or right, inside or outside and even fold around corners. Aluminium is inherently strong but when combined with our high security locks, you can rest easy knowing your home is incredibly secure. They are even built with reinforced glass slots and locks which makes removing the glass incredibly difficult. Better yet, the glass slots and locks are hidden into the frame of the door, this not only provides a smooth and streamline appearance but also means potential burglars cannot reach them. Designed to bring enhanced light to rooms, the aluminium bi-fold offers slim sightlines for wide open views. Your bi-folding doors can be tailored to your specification and are available in a low threshold option. This makes access easier for wheelchairs, prams and the elderly. We provide the market-leading bi-folding doors from SMART Architectural Aluminium. We supply SMART Aluminium doors because we are smart. Manufactured from the highest grade of aluminium, we supply the very best on the current market.Their reputation for quality, innovation, design and technical expertise has led them to be a leading fabricator of Aluminium. Our aluminium bi-fold doors are designed to match a wide range of homes. Choose virtually any colour from our RAL range. Matching door to home has never been simpler. Where Will You Install Your Aluminium Bi-Fold Door? You will need to think about the size and position of the door opening as this will be a key part of the house’s plans. Any late changes might require planning approval so it’s best to get a quote, survey and advice on where you plan to have your new doors installed. If you are looking to get aluminium bi-fold doors on finance in Essex then why not speak to a member of our team today? We specialise in supplying and fitting aluminium bi-fold doors throughout Basildon, Canvey Island, Chelmsford and surrounding areas of Essex. Our flexible finance options allow you to have your bi-fold door installed today rather than tomorrow. When you choose SWD Essex you can expect the highest quality aluminium doors – at the most competitive prices.